But I can’t just yet. I loved riding my bike in my youth. It was a great feeling back then, roaring round the countryside on two wheels and feeling the roll of the road beneath me. Now I’m getting close to early retirement and I want to do it again although, probably, at a slightly more sedate pace than in the past. Having saved the cash up, I went looking for a suitable machine. I decided I wanted a piece of British iron, or as close as I could get, so everything other than Japanese and Harleys was on the table. There wasn’t much around. 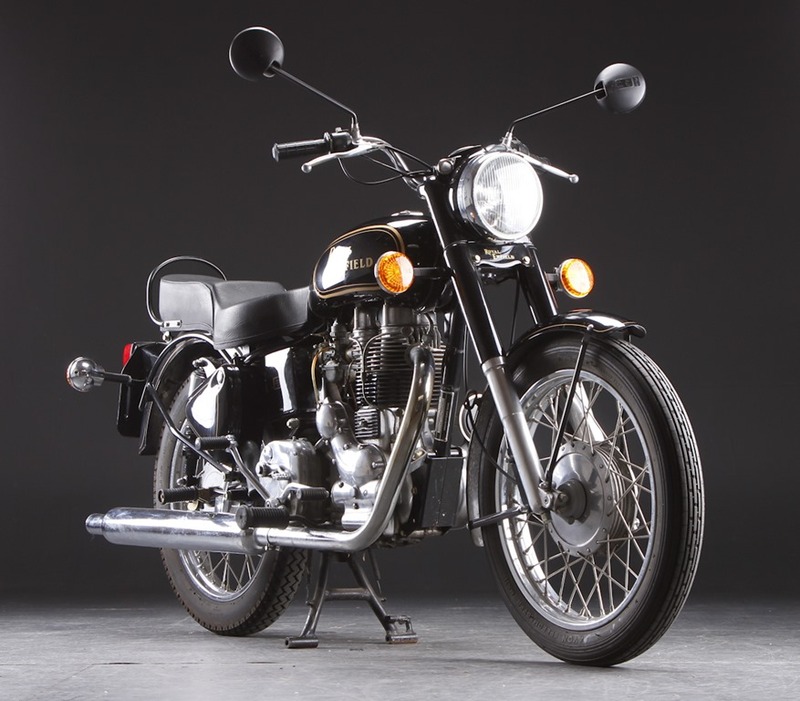 I did eventually hear of a used Royal Enfield Bullet 500, British design, now built in India by the old Enfield Company (Indian) factory. The design hasn’t changed since 1947. Asking price at the dealers was £4500. I rang the guy up and fixed a look-see. Unfortunately, a little later in the day, he rang back and told me the owner had changed her mind and the bike was now up for auction on the internet. He gave me the lot number and wished me luck. I found the auction and resolutely began bidding. I won in the end and got the bike for £3000. Money saved is money earned in my book. Put £1500 back in your pocket Exile. A little history came my way via the original dealer. The bike was bought new in 2005. The old guy that bought it got sick and never rode the bike past 1750 kilometers. He eventually passed away and his widow kept the bike until now. The bike has been in a garage for 8 years. It’s like brand new apart from the dust and a few perished rubber hoses and a flat battery. The dealer has tried the bike and it runs OK. It isn’t even run fully in yet. So far so good. Having bought it, the bike needed to be collected from the auction house. It is not registered yet so I had to collect it on a trailer with a great deal of help from one of my buddies. So, now, it’s at home with me in my shed. Unfortunately, the idiots at the auction house don’t know much about motor bikes and didn’t know how to start it. One needs to switch the engine to run, turn on the fuel, open the choke and then kick it over. They apparently did none of this and, when it failed to start, they decided it was the spark plug that was at fault and took it out to replace it with a new one. The boss even went out with it and bought a new plug but while I was picking up the bike in one city, he was 150 KM’s away in another. The eejit. So they’re going to post it to me later this week. So. it has to be re-registered in my name, I need to get it inspected for roadworthiness (Ha! No problem!) and I need to get a new number plate to register it as mine and put it on the road. Insurance is a given.. and it’s gonna be cheap because I’m a careful old git now and not a silly youngster like I was back in the day. Anyhow, once I get these things sorted out, I’ll be away. Look out Denmark, here I come. Vrooom!